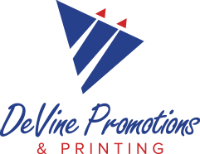 Welcome to DeVine Promotions & Printing, a marketing specialist located in Houston, Texas! DPP is a member of the Green Press Initiative which gives you peace of mind in knowing we care about our environment as much as you do. When ordering your newsletters, tri folds, post cards and annual reports, just ask for Recycled Paper to assist in your sustainability practices. We even have a material made from crushed rocks which prints and drys like paper! You spoke and we listened! Now Offering Promotional Products at prices will love as you grow your business and celebrate your accomplishments! There are literally hundreds of ways to promote your business with promotional products. Let us help you get creative in finding the right promotional items for your business. If you are in the area, stop by. We would love to see you and give you a tour of our new home! Come see why YOU should be printing all your projects with DeVine Promotions & Printing! she did and her team did a fantastic job. We will use her services again. Just received my new Infinite Image Consulting business thank you cards from Gaylyn Wilson- DeVine at DeVine Promotions & Printing. They came out amazing and the print quality is top-notch. The colors are so vibrant and the envelopes match perfectly. I am loving the peel tabs on those envelopes! The customer service provided by Gaylyn DeVine and the staff at DeVine Promotions & Printing is fantastic. They have done an excellent job of providing guidance from beginning to end of my projects while maintaining the integrity of my goals. I have known Gaylyn for years and she is always available to answer questions and responds within a timely manner. Their work at DPP is always, professional, affordable and most importantly knowledgeable.